Two days ago, I was discussing differences in the Dagger moths' sexual equipment. Today I am on the safer ground of the insects' nomenclature. The men and women who gave our UK moths their English names were an excellently imaginative bunch, but sometimes they erred on the side of literal descriptions. Thus, alongside the Peach Blossom and the Gold Spangle, we have the Lead-coloured Drab and the Small Dusty Wave. One of my favourites, or rather two of them, are another literal couple - that confusing pair: the Bright-line Brown-eye and the Brown-line Bright-eye. We have already had the former this year - here it is again below with its toothy marks - but my top picture shows the latter, freshly arrived with the July sun. The timing of the two moths' different seasons is worth knowing because the Bright-line Brown-eye is occasionally a pest on tomatoes and I am carefully tending two bushes of these. The two moths are not near relatives either but the Brown-line Bright-eye is a close cousin of the similarly-looking Clay which I showed here the other day. I featured the Barred Yellow on Saturday - here it is again, below left - and it made me think about the colours of moths, a subject on which I have mused from time to time. Governed by chemistry, camouflage and doubtless other factors, it remains a field in which new, young scientists might yet achieve great things. I have yet to read an explanation, for instance, of the almost complete absence of the colour blue which is so gloriously shown in butterflies, even the relatively modest ones of the UK. Our delphiniums are out now, with cornflower and love-in-the-mist on their heels. While enjoying these very much, the sight of them in the early morning increases my sorrow at the bluelessness of moths. Green isn't a lot better, though the emerald family gloriously save the day, but yellow - today's colour - is well represented. My top moth, the Swallowtail, is at the pale end of the yellow spectrum but very lovely for all that; and it is also a very good ambassador for UK moths. When people contact me with descriptions or photos of a moth which has wandered into their dining room or fluttered at their bedroom windows at this time of the year, it is very often a Swallowtail. Neither small nor brown nor madly flying like a demented bee, it is a perfect ambassador for the moth world. The Grey Dagger has arrived which is always a good moment. It ought to be 'Daggers' in the plural, though. Check out how many you can see on its menacing wing patterns. 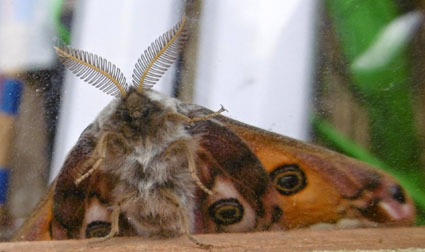 This is a moth which would have been at home in Wolf Hall. Her poster had a cartoon of a man's...well...sorry to be coy but this is a family blog, and the slogan: 'Everyone loves a comedy *****. No-one loves austerity." I was quite keen to pursue this issue but Penny restrained me and so I will never know the arguments on either side. What has this to do with moths? Well, as in quite a large number of cases of very similar species, the Grey Dagger and the Dark Dagger can only be told apart by close examination of their genitalia. In the past, I have usually simply passed this information on from the Moth Bible, but the young woman on the Tube makes me contemplate the scene in Linnaeus' laboratory. "I say, Carl," says one of the great man's assistants. "Have you seen the shape of this one?" But I will stop there, because the Grey (or Dark) Dagger is a very fine moth and does not deserve my titters. The moths were frisky this morning, perhaps because of bright, dawn sunlight at 5.45am and a lovely mild temperature. No sooner had I lifted the lid, than a gang of the smaller ones waltzed out, some skittering off into the distance but others staying closer to home. One of these was that welcome scrap of colour in the trap at this time of the year, the Yellow Shell Update - sorry, senior moment. As Trent points out in Comments, this is a Barred Yellow. The Yellow Shell came last week. I didn't mention then the interesting fact that its colouring is most vivid in southern parts of the UK. As you move north and west, the yellows and oranges become slightly browner until eventually you come across a sub-species which is tragically dull brown. Known appropriately as 'isolata', this Cinderella of the family lives only on the remotest of county Kerry's Blasket Islands in Ireland, Inishvickilean and Tearaght. Maybe one day I will pay it a visit. Or you might. My Barred Yellow made a beeline for my leg, at the same time as the pretty micro Anania coronata opted to sunbathe on my palm. Gradually, if you read this blog very carefully, you could be able to cut out and keep an entire jigsaw of me, always tastefully clad in my pyjamas. I thought my hawk moth tally for the year was complete, so this (above with my almost equally pink and beautiful thumb) came as a nice surprise this morning. A Small Elephant Hawk joined seven standard Elephant Hawks among the eggboxes on a very busy (and mild) night which saw a number of other interesting newcomers. As regular readers will be aware, I love Elephant Hawks because of their marvellous colouring. I think everyone does. I'm always very pleased when we have visitors on a day when an Elephant is slumbering in the trap. They never fail to win people over and do their bit to show that UK moths are not all small and brown. In the last two pictures from my Pink Period above, you can also see a Heart and Club on an egg cone and then in the background on the red strip of my towel, a Burnished Brass. The latter are such lovely creatures - and also great examples of non-small, non-brown moths - that I'll unashamedly add a picture below of the two which came today, even though there's a BB in the trap every night at the moment. The way the sheen is created by the refraction and reflection of light by hundreds of wingscales is as fascinating as the effect, and there is much learned material about it online. Still on the newcomers list - this time of the year is the absolute zenith of moth activity - please kindly welcome, below, a Willow Beauty (I am pretty sure) and a Buff Arches, with that spindly calligraphy like the tugra or Sultan's cypher on documents from the Ottoman Empire. I think we also have a possible Smoky Wainscot, below, although it's more than likely just a Common one. Help appreciated, as always. Time for a little break now with some more familiar but always enjoyable guests: a big Silver-ground Carpet and another of the most excellent tribe of longhorn micro-moths. Like its predecessor the other day, it has chosen the underside of the bulb collar to roost. 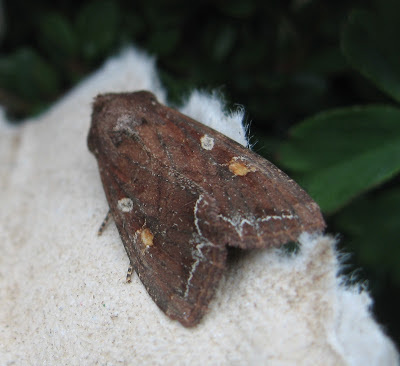 Although there had been a suggestion on the UTM blog that one of the moths might be a Sycamore, and my anonymous commentor here ingeniously suggested a Tawny Shears, I think the revised photos show that all three are Large Nutmegs. One of the lessons I draw from this is that I must find a CD player to check out the detailed instructions for my Panasonic Lumix. It's getting better (or maybe I should say immodestly that I am), but it can still panic over dark moths on light backgrounds. In case you have been wondering about the sudden introduction of my towel to the blog's photos, that is the reason. I thought the camera might prefer moths seen against a slightly darker backdrop. I may be on to something here. There was also a bonus from this because during rephotographing, I came across a very small, blurrily pretty moth which I'd overlooked. On a whim, I stuck a picture of it, above, on the UTM blog with the hasty suggestion that it might be a Least Black Arches. The expert Martin Albertini put me right, saying that it was a Muslin Footman which he kindly described as "a much more interesting moth." We were both rewarded this morning by the arrival of two more - and actually, I should have recognised it as I see from my records that it came both last year and in 2013. I must have a colony. Here are today's two, below, which have the coincidental advantage of showing my camera problems: the Lumix has had trouble with the very dark background of the bulb collar but is much happier with the transparent trap rim resting on my famous towel. Surely he can't go on even longer? Yes, but only to show you my latest butterfly photo - the tally here is well into double figures. This is a Large Skipper on Sweet William. Doesn't English nature have nice names? I tend to think of my younger sister and her family when moths like the one above fly in. It is a Shoulder-striped Wainscot, one of a large tribe named after the type of wooden panelling whose neat grooves were thought by 18th century equivalents of myself to resemble the moths' simple, veined wing patterns. None of my sister's family are interior decorators but a neat combination of her maiden and married names - the latter being Scott - has been converted into their email address. A second newcomer for the year last night appears next to part of the Wainscot family in the Moth Bible: this Small Dotted Buff, left and above, a male with the longer wings and simpler pattern which marks him out from his wife. Good things come in threes - at least, sometimes they do - and a further family member joined the pair among the eggboxes. Shown below, it is, I think, a Common Wainscot. I speak with hesitation, as usual with somewhat variable types of moth, and hope that I will be kindly corrected if wrong. I am also uncertain about the next character - first two photos below - whose markings don't seem to tally, quite, with the Heaert and Dart or Heart and Club which at first I assumed him or her to be. I will stick my neck out, though, and say that the moth after him, or her, is a Double Square-spot. Here's hoping. Elsewhere in the colour spectrum, I was pleased to see the Ribvand Wave, below, a moth which comes in two swatches: this one and a creamier variant whose ribbon is a becoming shade of beige. Now for another bout of silvery-grey-confusion. I'm beaten by all three arrivals below although I think that the third one may be a Common Rustic. I haven't given up yet - it's early in the day - and they are pretty distinctive. But I've yet to match them with any of Mr Lewington's fine portraits. Finally, I have often mused on here about the Peppered Moth and the effectiveness of its camouflage, but that failed to save the one whose forlorn remnants were by the trap this morning. A bat attack, I suspect, as I was up before the birds this morning, taking advantage of these lovely, long days. And finally, finally, this picture of a female Holly Blue down at my granddaughter's house in London is doubly impressive, to my mind at least, because I took it with the said granddaughter in one arm and the camera in the other. She was very pleased with the butterfly, although her word for 'butterfly' is not yet quite the same as ours. I can say 'female' with unusual confidence because of the smoky black tip to the forewing which you can glimpse in the picture. No trapping last night because of busy-ness but I have had another newcomer for the year nonetheless. I was hosing the veg patch as dusk settled in and the spray sent up a minor blizzard of small moths. Veg being dominant in my mind, I let them all flutter away undisturbed, except for one which caught my eye because - even as a scrap of airborne confetti - its bright orange colours were intriguing. It came to rest nearby and obligingly stayed put while I nipped in and found the camera. It's a Yellow Shell, common enough but not often seen, even by me, because it tends not to be interested in light. The Moth Bible adds, however, that it is 'often disturbed by day'. And so on this occasion it proved. Isn't its patterning delightful? I am probably addicted to novelty, as someone who made their living from the news for forty years. So it is obliging of the moths to provide me, almost every day, with newcomers to my eggbox hotel. They are seldom completely new these days, after ten years of running my light trap in Leeds and Oxfordshire, but the summer brings a scarcely interrupted flow of debuts for the year. This morning, for example, there are four of them. My favourite is the Beautiful Hook-tip shown in the first photograph, one of nine UK moths accorded the official title of 'Beautiful' in their name from the Beautiful Chestnut to the Beautiful Yellow Underwing. That list is a speck more exclusive than it looks because it includes the Beautiful Utetheisa, an American moth recorded in the UK only once, on Skokholm Island off Pembrokeshire at the end of July 1948. It is so rare that it doesn't even have its picture in the Moth Bible, which is a shame as you can see if you Google it. The Mottled Beauty, above is a beautifully-patterned moth, but to call it the Beautifully Patterned Mottled Beauty would be going a bit far. The notion reminds me of my predecessor as Northern Editor of The Guardian, Harry Whewell, who was rung up to be told that "...the Midland Hotel will in future be known as the Forte Crest (or some such) Midland Hotel." "Not by me, it won't," he replied. The Poplar Grey, next in my newcomers' list, stands out in the moth trap as one of a 'silvery' colourway of arrivals, which also includes the Dark and Grey Daggers and the Miller. This one was sleeping on the black plastic bowl of the trap which is a nightmare background for digital photography - which really does turn black white, or at least a dirty grey, in its heroic attempts to gather every bit of light it can - but I managed to entice it on to a scrap of eggbox for a photo shoot. Here's an example of what I mean about digital black magic, above. The background to my fourth newcomer, a sweet Single-dotted Wave, is black to the human eye. But not to Panasonic's Lumix. These little moths are almost impossible to disturb with them fluttering off. It seems to be an axiom of moths that the slenderer their body, the lighter they sleep. But luckily there were three in the trap this morning and one of them, below, had chosen a more helpful place to doze. Why is a moth which such a spattering of dots called the Singled-dotted? No one has ever enlightened me about that. The next moth shown, a slightly lifeworn Common White Wave (I think), may also be new for this year. I'm not sure offhand, and I need to get going on the morning tea so will scroll back through the records later. Isn't it graceful, though? A Laura Ashley moth, as is the Light Emerald which follows. I had to include the emerald, just because I like it, which also applies to the Buff Tip, below. Both pictures also include exciting glimpses of my knee, and in the case of the Buff Tip, the distant 'black' bowl of the trap whose effect on digital cameras I have moaned about above. Finally, two pieces of homework: one of the carpet moths pretending to be a butterfly, and a pug of some kind. Moth people get very grumpy about pugs, which almost all look annoyingly the same, but you can't blame the poor things for trying to help. This one's posture is typical - spreading itself out like a police search suspect. Sadly, it doesn't assist my ID efforts. Can a mother's tender care?